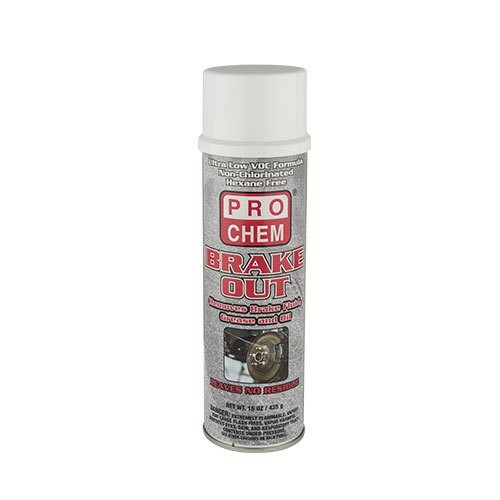 Brake Out | Pro Chem, Inc. BRAKE OUT is an economical, residue-free, super fast-drying, heavy-duty formula that removes brake fluid, grease, oil, dust, operating erosion and other contaminants from brake parts, pads, discs, linings and drums. BRAKE OUT features an up/down valve that allows spraying in an upright or inverted position. This product helps stop disc brake squeal, lengthens pad life and improves brake performance. Use BRAKE OUT in a well-ventilated area. PROTECT all rubber brake parts and painted surfaces from product and overspray. DO NOT apply BRAKE OUT while equipment is energized. Avoid breathing any dust or vapors that may become airborne. Holding can upright, spray BRAKE OUT liberally and allow to run off. Air or wipe dry with a clean soft cloth. Repeat as necessary. To expel entire contents, hold can at a 45° angle and rotate until all contents have discharged.